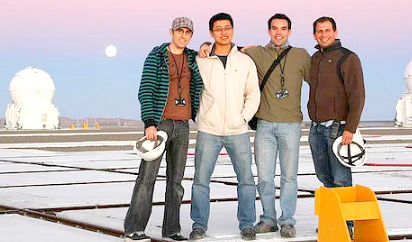 Eduardo Bendek (right) and the Optical Outreach Abroad team gathers at the Paranal Observatory platform during sunset. When Eduardo Bendek departed for the University of Arizona to study at the College of Optical Sciences (COS) as an International Fulbright Science & Technology Award recipient, he sought to promote scientific collaboration between the United States and Chile. During the second year of his PhD program, Bendek organized the Optical Outreach Abroad Program, bringing four of his colleagues from the University of Arizona to the Pontificia Universidad Catolica de Chile to conduct workshops on optical science. “I designed an astronomical optics workshop for COS graduate students to engage foreign scientific communities, as well as high school students, in the discussion of optical science while at the same time teaching them about other cultures,” says Eduardo. The outreach abroad program sought not only to engage optical scientists and engineers, but to also make a lasting impact on local high school students. The experience taught Bendek the challenges of organizing a successful multi-national education program that offers guidance for achieving long-term success.